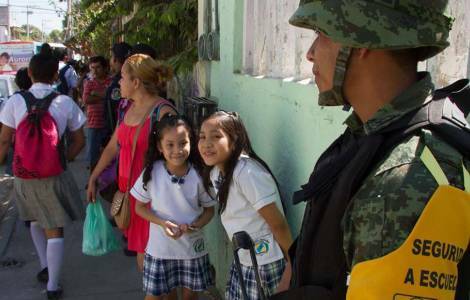 AMERICA/MEXICO - The Archbishop of Acapulco: "It is urgent to stop rampant violence and end impunity"
Itinerant service of the Scalabrinians on the border between Mexico and United States: "there are still too many women who suffer in the world"
Migrant caravans, "men of faith on their way towards a better future"
Acapulco (Agenzia Fides) - "We need to know the root regarding the acts of violence to prevent them from happening again": this is what the Archbishop of Acapulco, Archbishop Leopoldo González González says in a note sent to Agenzia Fides, commenting on the facts of violence which took place in the last few weeks and that continue to occur in Acapulco and make it one of the highest homicide cities in the world. Mgr. González stressed that "it is important that authorities act to guarantee justice", that impunity ends in order "to recover the trust of citizens in denouncing crimes and also avoid cases of lynching", when people do themselves justice. On the other hand, the Archbishop explained that "there are institutional ways to know the truth and restore justice, to resolve conflicts" such as those existing in the area of the municipality of Cacahuatepec which at the moment involves the interest of many citizens. The state of Guerrero in Mexico is facing great challenges for social coexistence: one of the main problems, also reported by Mgr. González about a month ago, is precisely the security of citizens. At the beginning of the public appointment for 80 mayors of the state of Guerrero, the Archbishop of Acapulco had addressed them to remember that "the service of authority of a mayor is very important, and must be achieved with the people". Together with the problem of violence, there are those of tax collection and extortion that "bleeds the family economy and the economy of cities", drug trafficking that "involves many teenagers and children". "In your electoral campaign you committed yourselves to guaranteeing security", the Archbishop wrote. AMERICA/NICARAGUA - Bishops of Nicaragua denounce "the harsh repression against peaceful citizens"
AMERICA/ECUADOR - The Bishop of Esmeraldas is alarmed by the situation of young people:"Violence is the fruit of the tree of injustice"